Wall light Alsace. The main structure is finished in recycled wood, black iron and the candle cover with a white wax effect. It is a design that fits perfectly in rustic style decorations for rooms like the bathroom.Dimensions: High 21,59 Cm. Length 40,64 Cm. Width 13,97 Cm. 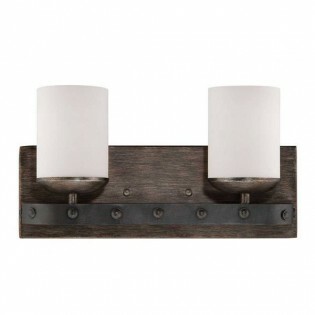 The lighting Collection Alsace, this Ceiling light has a beautiful base finished in recycled wood and black iron that is found covering the candles made with white wax effect. It is a perfect design to light up rustic style environments in rooms such as the cellar, dining room, living room...Dimensions: High 55,88 Cm. Length 58,42 Cm. Ceiling light Claiborne. Its design with avabite color finish and decorated with elegant glass pendants fits perfectly in rooms decorated with luxury and classic style. Ideal for placing in your dining room or living room. Dimensions: High 47,63 Cm. Length 45,72 Cm. 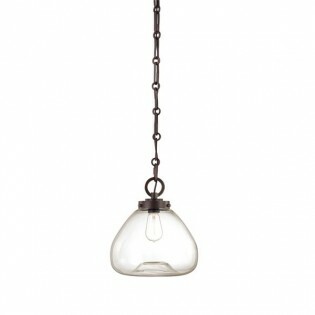 Pendant light from the collection Fairfield. 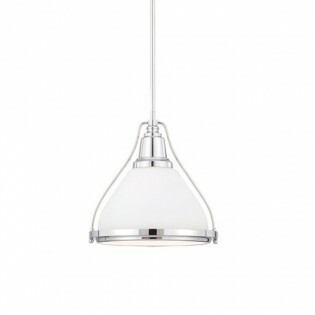 Ideal for lighting large spaces with a modern and modern style, such as the dining room, living room or bedroom. It has a chrome structure and oval-shaped glass cups.Dimensions: High 190,5 Cm. Length 76,2 Cm. Ceiling light Fez designed by Federico Martinez, modern-industrial style and composed of six lighting points. Adjustable height. Main structure made of metal and fabric lampshades. Ideal for living rooms, bedrooms etc.Dimensions: High 76 - 106 cm. Length 74 cm. Ceiling light Filament classic and elegant, consisting of four points of light. 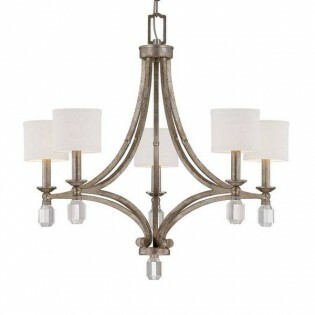 It incorporates straight and wavy shapes with a silver finish and metal candleholders. It is a perfect design for lighting rooms such as the dining room, living room, bedroom etc. Dimensions: High 86 Cm. Length 45,72 Cm. Ceiling light Fultron. Its design is composed of fine lines made of brass, ingese bronze and six spherical-shaped lampshades made of transparent glass. Its design will allow you lighting beautifully in dining rooms, living rooms or bedrooms in classic style.Dimensions: High 213,36 Cm. Length 68,58 Cm. Pendant light Geneva decorated entirely with porcelain elements. It is completely finished in white and has three lighting points. Its original design will bring elegance to the room of the house where you place it: bedrooms, dining rooms...Dimensions: High 46,36 Cm. Length 40,64 Cm. Pendant light from the collection Mallory with a beautiful standing effect in its finish and numerous inlaid details that give it an original and daring touch. Wax effect candle holders. It is a perfect design for general lighting of bedrooms, living rooms, dining rooms, etc. Dimensions: High 44,45 Cm. Length 45,72 Cm. 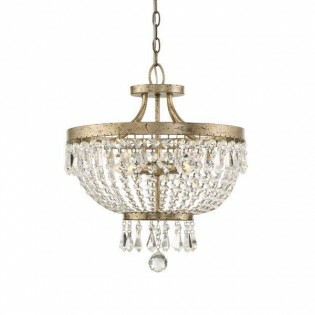 Ceiling light Retro-vintage style ideal for placing in the dining room, living room, kitchen.... It features a very distinctive design with a structure finished in English bronze designed in the form of a cage and lampshade in transparent granulated glass. Dimensions: High 48 Cm. Length 17,15 Cm. 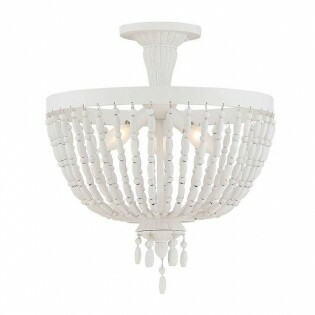 Ceiling light classic style with beige lampshade fabric covered by elegant structure with fine silver finish lines. It is the perfect lamp to place in rooms such as the dining room, living room, bedroom etc.Dimensions: High 40,64 Cm. Length 40,64 Cm. Pendant light Rosendal with six original design lighting points with straight and elegant shapes that add elegance to the lamp. It has a silver finish with beige fabric lampshades, ideal for decorating and lighting the dining room, living room, bedroom, etc.Dimensions: High 79 Cm. Length 76,2 Cm. 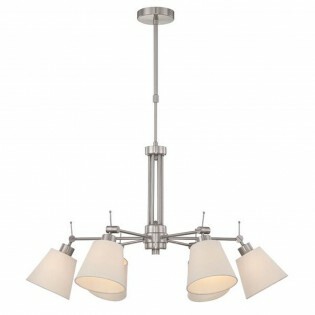 Ceiling lamp School House with chrome finished structure. The beautiful design of the transparent glass lampshade stands out. It has a modern style that is ideal for use in rooms such as the dining room, living room, bedroom, etc. Dimensions: Height 29,21 Cm. Length 25,4 Cm. Pendant light School House de estilo moderno con lampshadea muy original fabricada en cristal transparente y estructura principal acabada en cromo. 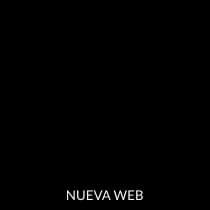 Su diseño moderno y actual es perfecto para decorar el comedor, salón, dormtorio etc.Dimensions: High 113,67 Cm. Length 35,56 Cm. Ceiling light of great beauty and design with turtle-shaped shell covered with transparent crystals and white metal drop-shaped candleholders. 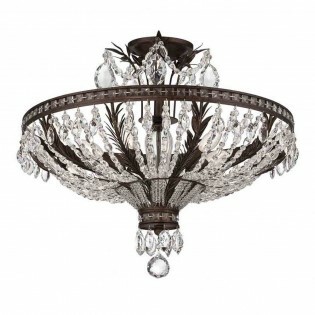 Ideal for lighting your bedroom or living room in classic style.Dimensions: High 52 cm. Length 61 cm. 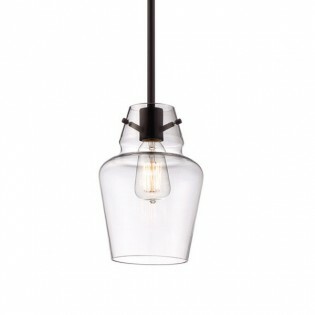 Pendant light modern style, perfect for use in the bedroom, living room, dining room, etc. 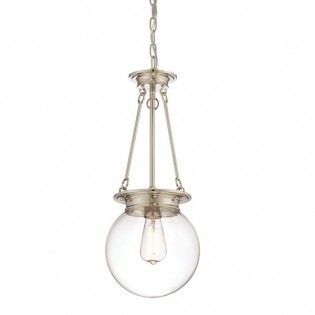 It has a structure made of opal glass in a soft cream colour covered by a beautiful structure finished in warm bronze. Dimensions: High 22,86 Cm. Length 38,1 Cm. Width 10,16 Cm. Pendant light Spinnaker 2 lights Cylindrical design made of cream-coloured opal glass covered by an elegant structure with a warm bronze finish. It is an ideal lamp to place in bedrooms, living rooms, dining rooms or other modern style rooms.Dimensions: High 200,66 Cm. Length 25,4 Cm. Ceiling light Spiro with spiral-shaped design, lead-aluminium finish and metal lamp holder in the same colour. Available in two sizes, each with different light points. An ideal lamp to light up your living room, dining room, bedroom etc. Dimensions: - Small:High 76 cm. Length 66 cm. - Big: High 103 cm. Length 91 cm. 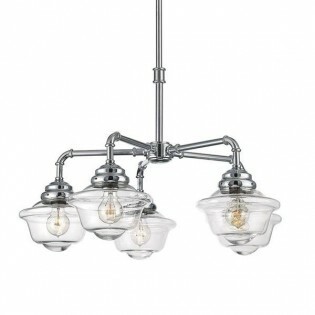 Una Ceiling light designed by Raymond Waites with five chandelier-shaped lights (bulbs not included). 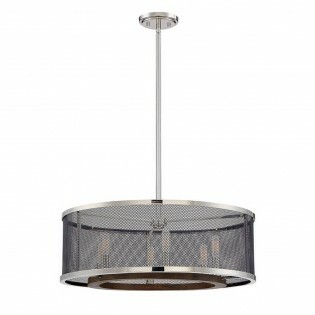 Classic type, ideal to give an distinctive style to your living room, with the lampshade made of metal mesh and the structure of aged steel.Dimensions: High 73 cm. Length 61 cm. 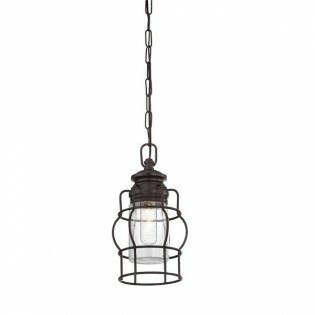 Pendant light Tekoa of classic style. 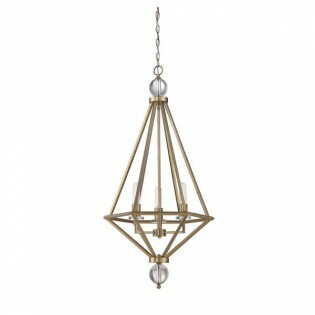 It is designed in the form of a cage with a warm bronze finish combined with glass elements. It is perfect to place in interior areas such as the dining room, living room, bedroom.... Dimensions: High 118 Cm. Length 51,44 Cm. Ceiling light Valcourwith Attractive and original modern style design consisting of four candle-shaped lighting points (metal candleholders). Graphite mesh cover with a wooden ring at the bottom. Ideal to illuminate rooms such as the dining room, living room, bedroom....br />Dimensions: High 29 cm. Length 41 cm. Ceiling light Valcour with six points of light (metal candleholder) and possibility of height adjustment. It has graphite mesh decorating the entire structure and decorative wooden ring on the bottom. 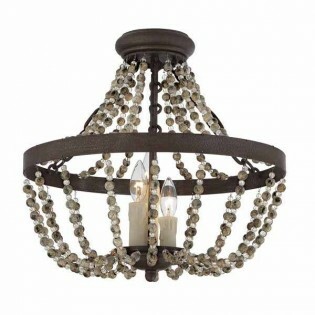 Ideal for lighting living rooms, dining rooms etc. Dimensions: High 20 - 164 cm. Length 61 cm. 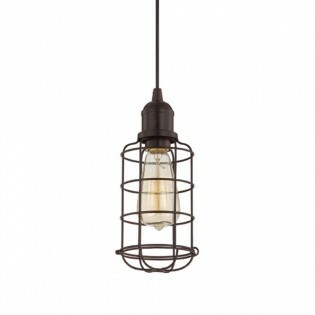 Mini Vintage type Pendant Light muy original. Inspired by metallic tones and decorative cages. Finished in English bronze. Exquisite finish. Perfect for combining several units in bars, restaurants, hotels or country houses with charm. Dimensions: Width 11 cm. High min 30 - max. 305 cm. Mini Vintage type Pendant Light very original. Inspired by metallic tones and decorative cages. Metal lampshade finished in chrome colour. Exquisite finish. Perfect for combining several units in bars, restaurants, hotels or country houses with charm. Dimensions: Width 17 cm. High min 35 - max. 107 cm. Mini Vintage type Pendant Light very original. 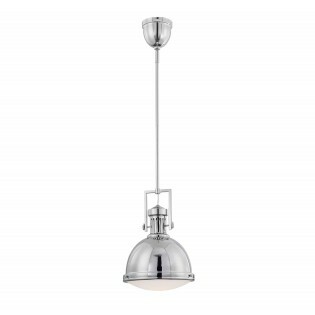 Inspired by metallic tones, chrome finish and white glass lampshade. Exquisite finish. Perfect for combining several units in bars, restaurants, hotels or country houses with charm. Dimensions: Width 30 cm. High min 37 - max. 109 cm. Vintage type Pendant Lightvery original with a transparent glass globe lampshade and metallic structure finished in English bronze. Perfect for recreating those days of yesteryear of incandescent lighting. Exquisite finish. Perfect for combining several units in bars, restaurants, hotels or country houses with charm. Dimensions: Width 29 cm. High min. 52 cm. 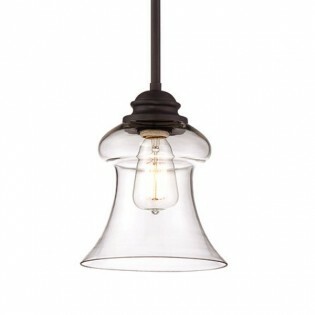 Vintage type Pendant Lightvery original with a transparent glass bulb lampshade and a bronze finish structure. Perfect for recreating those days of yesteryear of incandescent lighting. Exquisite finish. Perfect for lighting up restaurants, hotels, wineries or charming country houses. Dimensions: Width 36 cm. High min. 101 cm. 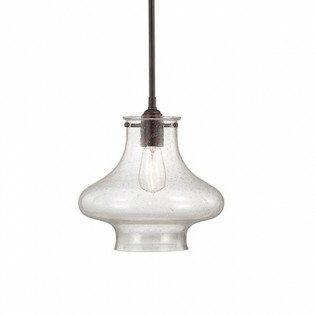 Vintage type Pendant Lightvery original with a transparent glass bulb lampshade and chrome finish structure. Perfect for recreating those days of yesteryear of incandescent lighting. Exquisite finish. 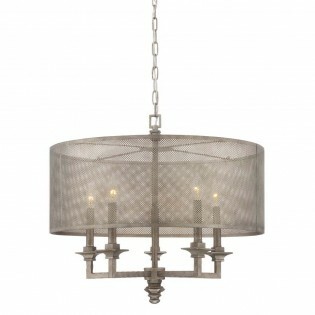 Perfect for lighting up restaurants, hotels, wineries or charming country houses. Dimensions: Width 23 cm. High min. 76 cm. Mini Vintage type Pendant Light very original. Inspired by metallic tones and decorative cages. Satin nickel finish. Exquisite finish. Perfect for combining several units in bars, restaurants, hotels or country houses with charm. Dimensions: Width 14 cm. High min 30 - max. 305 cm. 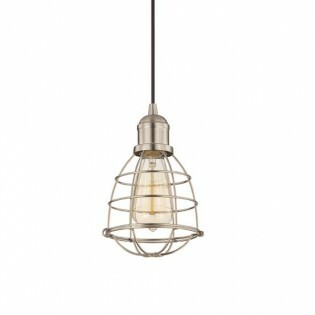 Pendant light from the collection Vintage Pendants with nickel finish and cage-shaped lampshade made of white opal glass. Ideal for decorating the dining room, living room or bedroom with a retro style.Dimensions: High 123,19 Cm. Length 27,94 Cm. 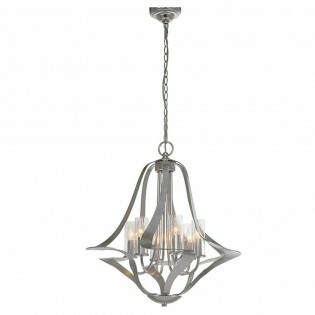 Ceiling light Claiborne with a spider-shaped design finished in a beautiful avalite color. The glass pendants that decorate all its structure give a classic and elegant touch to the dining room or the living room where you place it. Dimensions: High 103 Cm. Length 83,82 Cm. Ceiling light Filament designed in the shape of a chandelier with a triangular structure finished in silver leaf and formed by five points of light. The lampshades are textiles with a broken white finish. 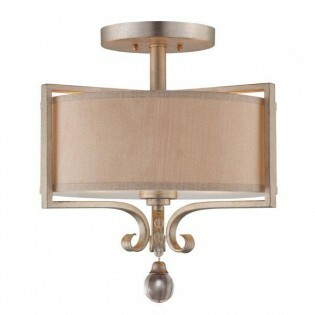 Thanks to this lamp you will light up with a classic style dining rooms, bedrooms etc.Dimensions: High 83 Cm. Length 63,5 Cm. Ceiling light Geneva with a large spider-shaped design made entirely of porcelain. 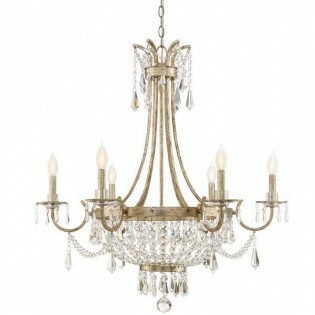 It is a very elegant white colour with five metal candle-shaped lighting points. Ideal for lighting up the dining room, living room, bedroom etc.Dimensions: High 100 Cm. Length 76,2 Cm.